We’ve been a bit slack on the dev blogs the last couple weeks, rest assured we’re hard at work on the content patch dropping this Thursday. Main features include an overhaul of how we handle water including adding swimming mechanics, new town events, a big upgrade of our Unity engine version (about 2 years of updates), the new Mac10 SMG weapon and a ton of bug fixes. Water has turned out really nice, while this patch mainly focuses on the interaction of water, players, vehicles, animals etc and introduces some basic water features throughout the map, it paves the way for the upcoming islands patch which will drastically change the way that end game is played. We spent a bunch of time this wipe playing and came across some very annoying bugs like name plates disapearing, re-amber protecting your gear being mega glitchy. Name plates should now always show on other players, we’ve also introduced a protect all feature to amber protection to reduce the friction between respawning and getting back into the fight. By right clicking on a stack of amber, you will see the option to protect all in the current storage. Thursdays patch will be going out at 5pm Melbourne time and will force a wipe for all severs. Since last devblog I’ve been mostly working on our upgrade to the latest version of Unity (2018.3). This upgrade brings some significant performance improvements, most importantly being the physics engine being upgraded to PhysX 3.4.2 and the terrain rendering system moving most of its processing off the cpu and onto the gpu. This upgrade should also help with stability in the long term because we’ll be back on a properly supported version that is receiving patches and fixes but in the short term there will probably be a bunch of teething issues to sort out when the upgrade goes live, I’m expecting some hotfixes early into the 0.7.2.x cycle. As well as the 2018 upgrade I’ve also been working on 0.7.1.x hotfixes mostly dealing with issues in the tether system. Most of the tether issues were due to the joint constraints getting into an impossible to fulfill state which was causing it to create some insane forces and shoot stuff all over the map. Currently to stop this occurring I added in a simple force limit beyond which the tether is broken but in testing I’ve seen promising results from changing the simulation to be 2 bodies connected by one joint instead of 3 bodies connected by 2 joints and also turning off the auto correct impossible configurations system. This more comprehensive fix was put on hold until our Unity upgrade was complete as the physics engine upgrade would mean a bunch of duplicated work to rebalance and retest the system post-upgrade. Unfortunately the Unity upgrade has taken a bit longer than expected so it’s unlikely I’ll be able to implement the true fix for the 0.7.2.0 release but it should make it into a post-release hotfix. I’ve also been implementing the new Mac10 sub machine gun into the game, which will be a high rate of fire, short to medium range gun introduced at the titranium level of crafting. Whilst it will be launching with only the base attachments (standard mag and ironsights) and a single flat color pattern we plan to fully stock it out with extra attachments and patterns in future patches. I’ll be away taking a holiday for the next 2 weeks, so seeya after that. 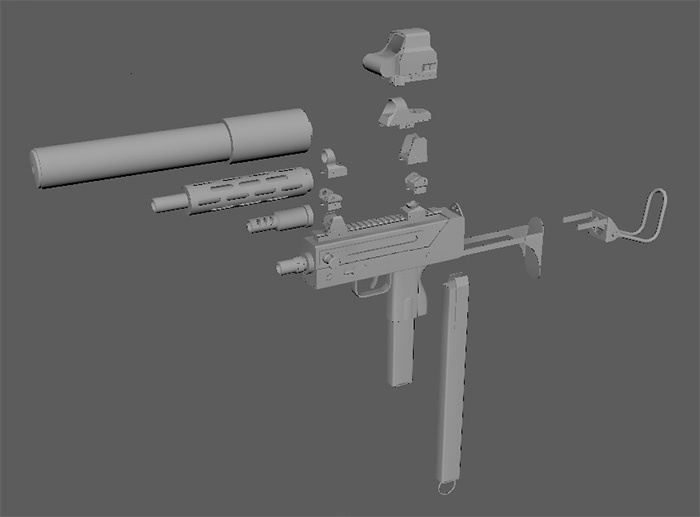 Update: So I got back from the holiday and here’s the MAC10 with a few more parts. Coming along nicely. So this week I’ve been speed building town event levels, got two so far, they are pretty enjoyable, tried to make the way they play match the level of gear players would have in these specific areas. They will both be placed close to the shore line in the jungle areas, which means most players will be coming in with tier 1 bows, spears and hatchets so I’ve made sure the levels have a bunch of tricky routes and decisions to make meaning players with low tier gear can prevail using knowledge of the map. The second map is a pretty weird one, I went with this tree house , multi-level type design, very vertical, which is something I’m interested in exploring more. I would like to get one more event done and then drill down on some modular building assets so I can replace the grey boxes with some actual nice looking assets. 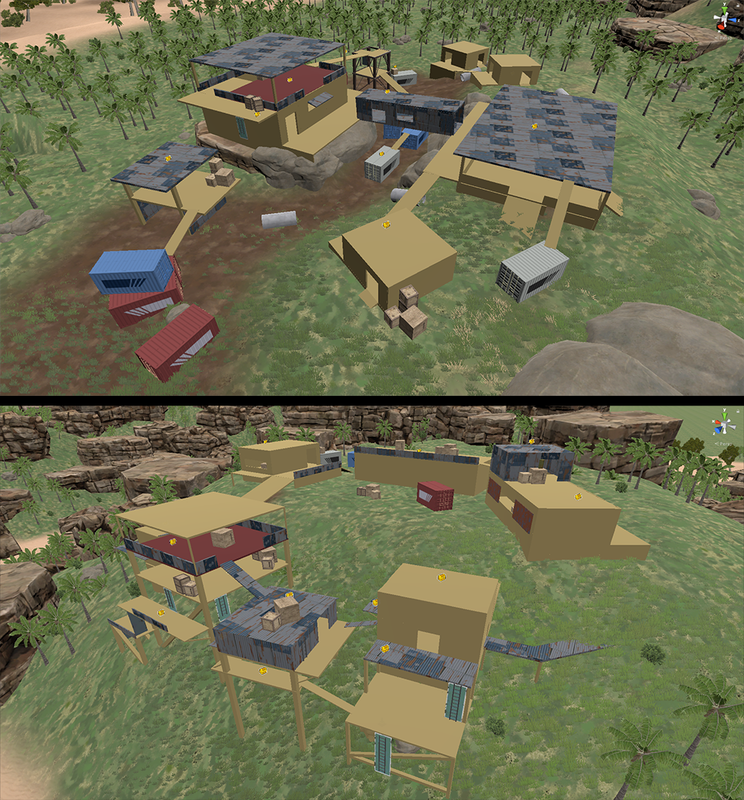 So this is the before and after stage of building the towns, start with a grey box so you can design the actual play-ability of the level without worrying about visuals, then when you feel like you’ve got that sorted, you move on to replacing all the grey boxes with something visually interesting. I also worked on some swimming animations, I’m not an animator but I have bit of a grasp on the basics and understand the general pipeline. I made a breast stroke animation and a wading in water idle animation, I would also like to update the get up from crash animation as well, it’s pretty place holder. Been a minute since I’ve been in the blog, but I’m back grinding on this extended trailer. We realised whist the V2 trailer was action packed, fast paced and lots of fun. 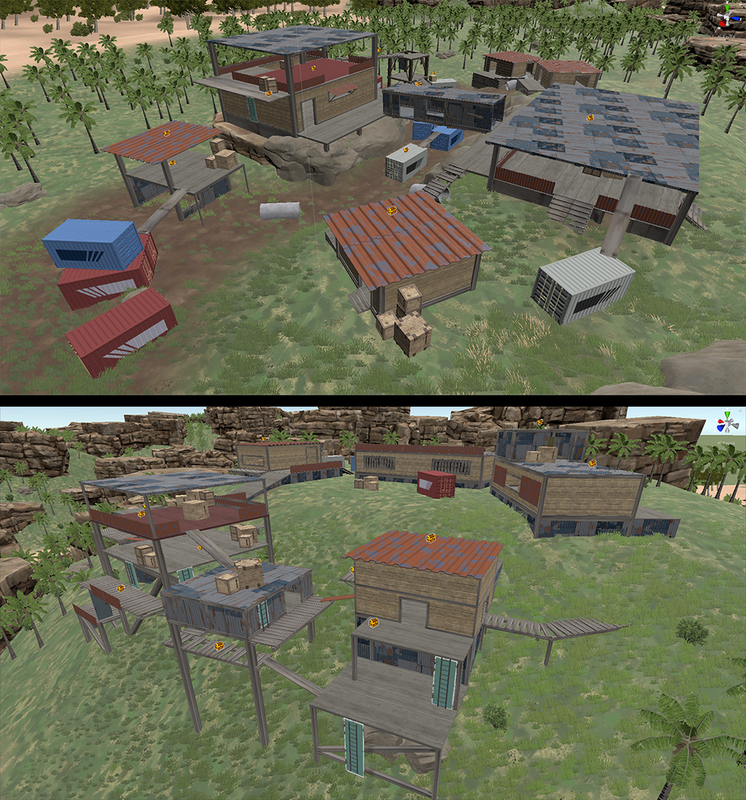 It didn’t quite communicate some of the best things about Hurtworld, so over the last two weeks we got the squad together and captured some great moments of teamwork, heartache and PVP action. Aside from this footage I have also captured a large amount of cinematic style shots to assist in showing the games function and features. During the time spent capturing this footage we have worked out there are more things that need to be added to the script, not to mention after hearing my voice overplayed on loop, I am no longer happy with the delivery. So new words, better internation, longer shots, more gameplay and 5 players worth of footage to go through and edit. I better get back to it. Todays dev update will aim to give you some insight into what our plans are over the next couple of months. Unity 2018 Upgrade – A long time overdue, we will be finally upgrading to the latest stable version of Unity. This should bring performance improvements and tons of bug fixes we have been waiting on for a while now. New Town Events – Aiming for 2 fully fleshed out new town events on the road to replacing all the duplicates on Nullius, we also plan to tweak the town event system to make them more engaging and worth while for all players. We will see how we go with this content patch before planning exact features of future ones, however we have a loose idea of where we want things to go in future patches. Ultimately we feel remaining in early access tag is starting to feel a bit stale, and will be working over the next few content patches to bring the quality of life and stability up to a point we feel we can finally exit early access. We’ve got a bit of work to do here, now we are back in a single branch we feel it shouldn’t take too long to finally fix up all those long standing issues that aren’t game breaking but keep out players that expect a higher level of polish. With helicopters in game, and soon to be decent water mechanics we can hopefully push forward with new map design elements we’ve been waiting to play with for a long time: Islands. We feel these should fit into the end game and require high end vehicles like Mozzys to travel to. I imagine them being relatively small, having specific unique traits or resources on them, and could potentially be controlled by a single clan and competed over as part of the endgame meta. This is a fairly long term goal but don’t see why we couldn’t get there in 2 or 3 content cycles. The territory control system is in a bit of a shell state at the moment, there are elements about it that I love, but obviously the execution is pretty placeholder. We plan to flesh out the competition for territory control to be more interesting like town events that require building, and incentivize clan leaders with more than just a point system. Likely something along the lines of purchasable vanity items for the leading clans. As part of the V2 camera overhaul that I did last year, I invested in making sure we can support things like shooting from vehicles in future. Although there is a fair bit of work to do still, we think adding this element will make fighting out in the world a ton more interesting. This would also include things like rocket pods on the Mozzy which shouldn’t be too hard to execute on. Before you jump to tell us how this will break the entire metagame, we will obviously give it a lot more thought before actually going ahead with it, these are just loose plans. Raiding balance requires a lot of love. It is a very hard thing to balance between big clans, solo players, people who want to farm and people who want to PVP hence why we’ve typically laid on the side of making defence easier than raiding. We are aware of the issues and will definitely spend a proper amount of time designing a more balanced system that hopefully satisfies everyone (I can dream :S). We have a ton of new creatures in the pipeline from years ago, without an animator we’ve been unable to finish them off not to mention the limited AI support to make interacting with them interesting. Splatt has been plugging away at animations and we are almost at a point where we can push forward with getting all our new creatures in game over the next few content patches. There are a lot of smaller things we’re working on, these are the main big features we want to see in game in the near future. We care about your feedback, drop us a line on the forums with your thoughts. If you want us to take your posts seriously, please be respectful. Since last dev blog I’ve been working on a bunch of different stuff that all went into 0.7.1.0. I started with bringing back the succulent plants with their consumable sunscreen item. This helps to bring the heat progression more in line with the cold progression to compensate for its environmental pressure being stronger during the day hours and day cycles being longer than night cycles. In order to support the crafting of medusa vines I made some improvements to the item transition system to ensure irradiated owrong seeds would work correctly. First I upgraded our item transition tooltips so the progress bar continued to show on an inactive transition, this allows you to see how a transition’s falloff works as its progress returns to 0 over time when it is inactive. I also upgraded the entity stats builders for all our storage machines so they are affected by radiation in the same manner as players, this allows you to place a storage (chest/locker) in an irradiated zone to safely irradiate the items within whilst you stand at a safe distance. We’ve been getting lots of reports about hit registration errors and our system seems to be a little overly keen to deny shots at the moment, whilst we investigate this properly I’ve made a few changes to the hit feedback logic that should make things clearer. The crosshair hit marker used to be client predicted meaning that when your client detected a hit it would be instantly shown but the hit doesn’t really take effect until the server registers it as well. If the server disagrees with the hit it denies it and tells your client to show the blue crosshair hit marker but a case did exist where your hit packet would be dropped (eg. corrupted or lost) so the server didn’t know about your hit to send back a deny message. Now in this new configuration all crosshair hit markers (hits, crits and denies) are driven by the server so you should no longer get any ‘fake’ hit markers appearing. The downside to this is that the hit marker isn’t as responsive but I think correctness is more important whilst we work out the issues with hit registration. Hello, this week I worked on getting a female version of the rebel gear set together, it all went pretty smoothly, nice to have a bit of variation between the hot and cold gear. I also fixed a lot of skinning and clipping problems, I would have loved to have gone much deeper on it but the way we do animations with additive animations to create more depth to our animations means that making sure the skinning is perfect all over is actually a pretty difficult job as nailing down exactly what additive animation is causing the problems is gonna need some extra work. I’m now back on map stuff, doing some new town events that actually tie in with the world to get rid of all the duplicates we have, it’s a big job but it will be worth it, the first one I’m doing I’m pretty excited for, it’s very much gonna be based around early game weapons as it’s position in the map is extremely early game. So lots of mobility and spear/bow kills to be done. The Tether arrow seems to have gone down well this last week. Some amusing videos have been surfacing which is nice 🙂 The arrow and rope came out well. 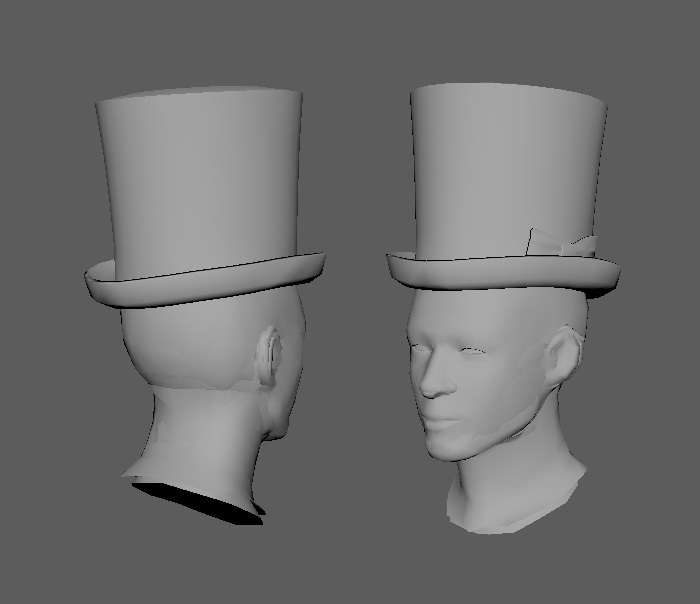 It was good to get my hands on some skinning work again after so long. 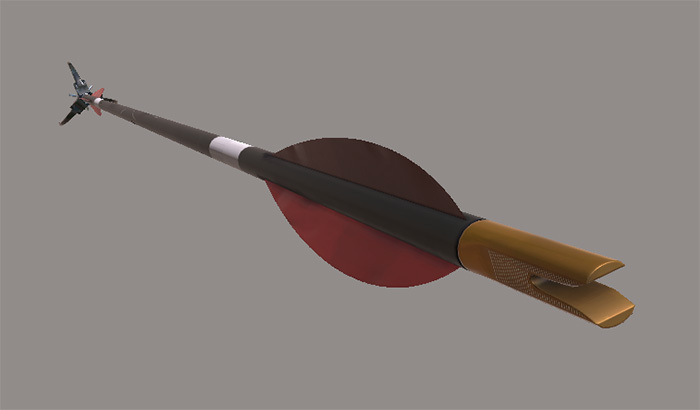 Skinning is the process of painting the mesh’s vertices which defines a % between 0.0 and 1.0 value for each vertex. This tells the software which bones affect which parts of a mesh and how the mesh deforms based on those values. 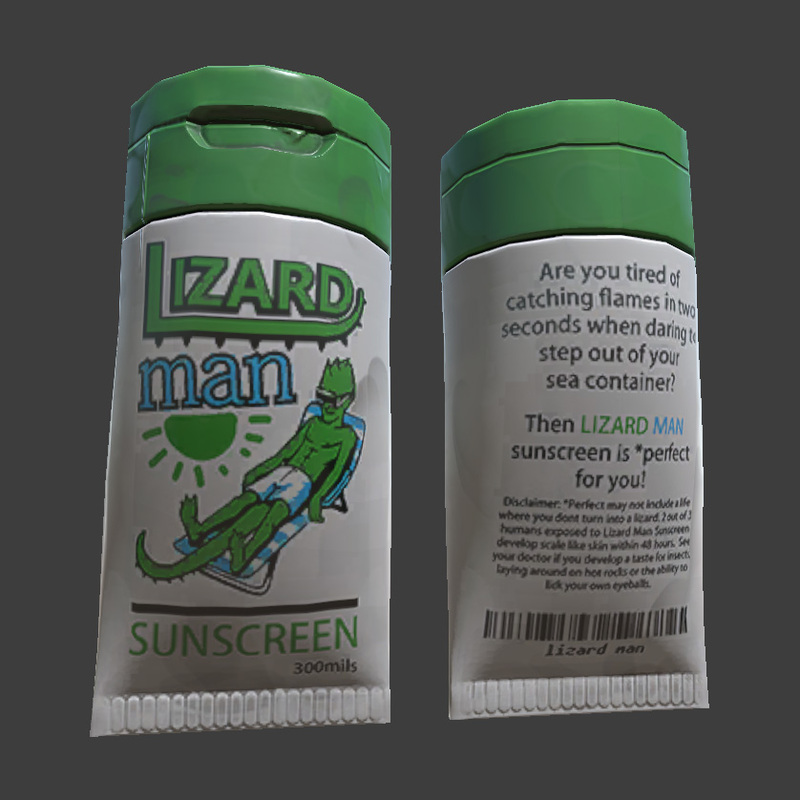 Also I whipped up a nice little tube of sunscreen with some hilarious in-joke art on it which I almost got in the game for the patch before I was struck down mercilessly by a plague Later in the week. I’ll put this in to go out with our next patch. Also good news for all you gun nuts out there, we are adding another weapon! 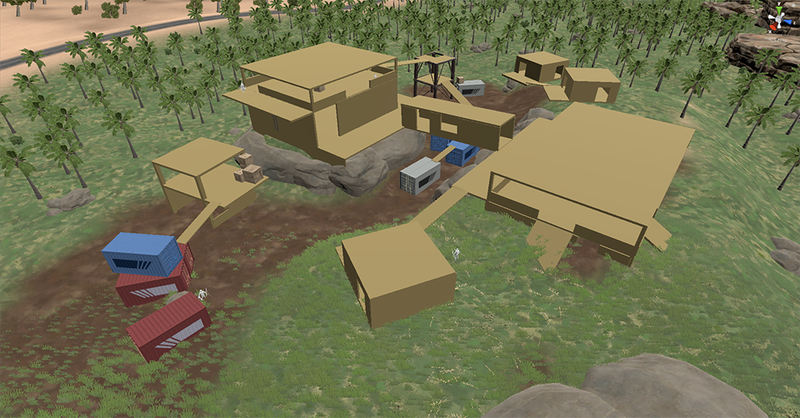 So I think I’ve posted work on this before, but we never made it a priority to build it. 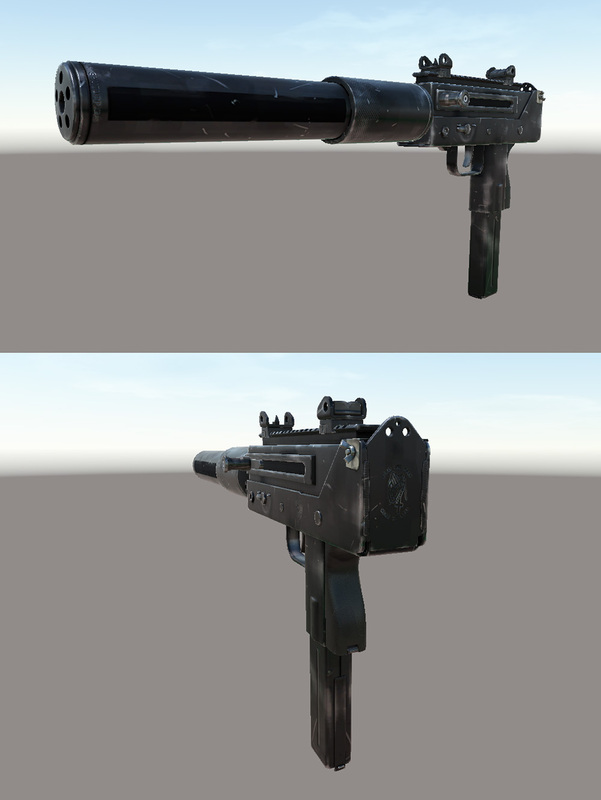 So the gun is going to be the MAC10! There are a whole lot of parts that I’ve already built in low poly for this bad boy. I’ll focus on a base set to be ready by our next content patch. This should be about 6 weeks away, I’ll let Spencer tell you the details about the patch though. Content for the 0.7.1.0 patch is coming along well but we’ve decided to push the release of it back 2 weeks until the next wipe (28th February, we want to get back to Thursday wipes) to give us more time to polish and expand on some of the new stuff that we’re adding that we’re really excited about. I think this also shows us that 4 week content cycles may be a bit too ambitious for a team of our size and 6 weeks is a much safer bet but we’ll continue to evaluate this as we stabilize and have to do less hotfix emergency repairs. Speaking of stuff we’re excited about I’ve been working on traps. I started off with creating a fake sleeper trap, this looks just like a regular sleeper when placed but once it is killed it explodes killing nearby players. This should create more interesting choices when encountering sleepers leaning more into a risk/reward dynamic. After the fake sleeper I created a fake airdrop beacon, planting this one will spawn an airdrop plane that drops a dummy cargo container. This cargo container looks like the real thing but when interacted with it will explode in your face. I think these items are going to open up new options for players to play mind games with each other trying to bait and then punish players greed, I’m super interested to see what strategies people will come up with. With the extra time we’ve given ourselves I also want to look into fake loot crates and experiment with traps that do other stuff than just explode, potentially using the tether system that Spencer has been working on. I’ve also been bringing back the legacy traps, the landcrab mine is working again and I’m hopeful of getting the medusa vines and poison traps in too for 0.7.1.0. We’ll still be wiping servers with a minor 0.7.0.11 patch today (15th Feb) that has a whole bunch of bugfixes and some balance tweaks. This won’t be an enforced wipe and community servers will be able to carry on their saves if they wish. In terms of bugfixes I’ve improved the camera collision peeking issues thanks to your reports and I’m cautiously optimistic we’ve now got a proper robust solution, again if I’m wrong please hit me up about it at tom@bankrollstudios.com. I’ve also been working on the notorious rock issues, the fix for exploiting crouching emotes got released in 0.7.0.10 but I’ve been continuing to investigate and have fixed some incorrect construction validation volumes on a few machines and base parts as well as tweaking sleepers so they work exactly like players in the construction validation check. I’ve also fixed the Mozzy claim cost not working properly and Mozzy sounds playing at the wrong times. Afternoon, this week I got this rebel gear set I’ve been working on, in game. My idea with this was to potentially have this set replace the heat progression gear as some of our gear is just the same stuff re-coloured, and aside from just needing a bit more gear in general, I felt like the heat progression needed a bit of love. 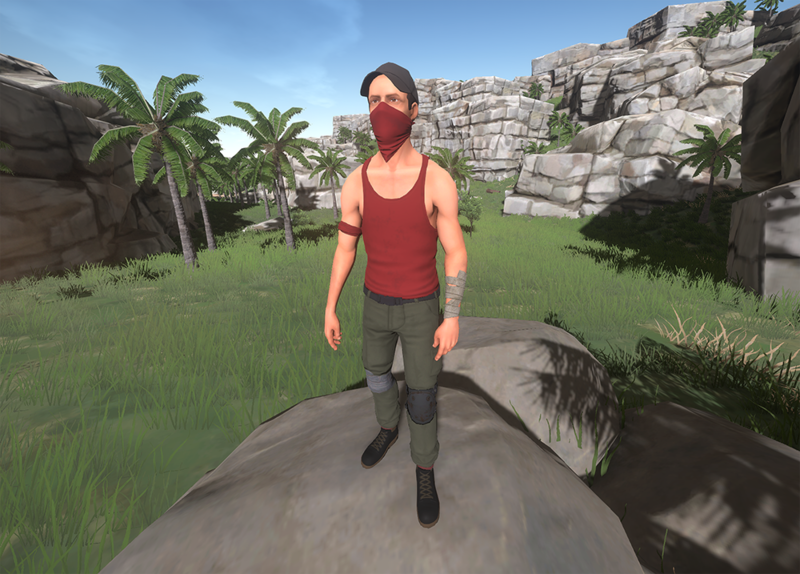 So the separate parts are hat, bandanna, new singlet with arm band and bandages, some roughed up military pants with one knee pad and duct tape on one leg, I wanted it to look like what I imagine a secret island militia would dress in. I think we have needed a bandanna and basic hats for a while now, planning on doing a few different hats, like a flat peak and backwards hat, also with the mesh attachment system can easily do stuff like adding the sunglasses Mills made too the bandanna which will be cool. Would love to do more of these set type things in the future, as an artist I very much want to bring the stuff you actually craft in line with where you are in the progression, for example, starting out naked on the beach, in my eyes it makes more sense that the first clothing you craft is very primal and bush craft sort of thing, rather than just a full on T shirt and Jeans, not that it matters but it’s just something I would like to do haha. Next up is fixing all the skinning on the clothes so there is no where near as many clipping issues. Hey Hurters! 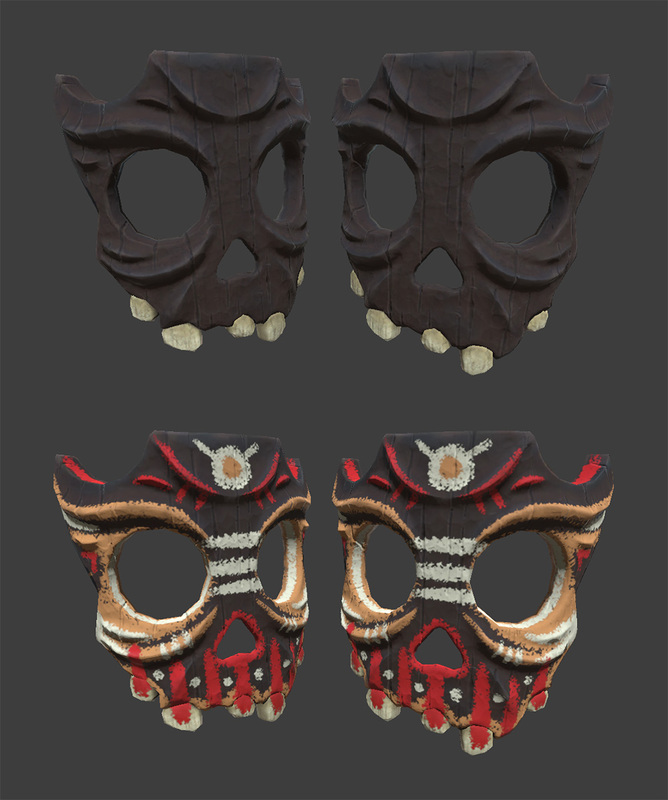 So this week I had some software issues with 3D Coat that stopped me getting as far as I wanted with this Hurt Voodoo mask but I got there eventually. I’ll be continuing to talk to the Developers of that particular piece of software about the issues that come up so they don’t become the bottle neck on my workflow again. Ever wanted to look like a smooth jerk? Well look no further than this little beauty! What’s really hood Hurtworld fam? This week I am back in the directors chair starting a new in depth trailer that breaks down the fundamentals of the game. Script writing has begun for a voice over that will take the viewer through the mechanics whilst trying not to give too much away. The video will be longer edits and more game play orientated footage to give a stronger understanding of how the game plays and an insight into some of the systems and how they work. One thing that we will require is a large amount of PVP footage which is hard for us to generate ourselves in a realistic scenario. So as a result we are calling out to the community to submit their favourite game play moments to demonstrate high skill level playing in the trailer. We can’t guarantee that everything submitted will be used however the better your footage the higher your chances. Try and keep your captures close to 60fps at 1080p and fairly high quality settings (No potato mode). Any footage used will be credited and immortalised forever in the video. I can’t wait to see what you all come up with and piece it all together.